Quinnell made his international debut in the most rarefied of atmospheres - a Lions Test match. It was the third Test of the tourists' victorious 1971 series against New Zealand, with Quinnell the sole uncapped member of the party. 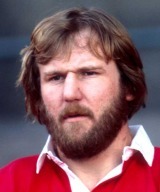 In 1972 he made his Wales bow and went on to win 23 caps, plus four more for the Lions on their tours of 1977 and 1980. Two of his sons, Scott and Craig, would follow him into Wales jerseys while Scott would also win Test caps for the Lions. His youngest son, Gavin, has represented his father's long-time club Llanelli, under the regional banner of the Scarlets.